2009 was the 250th anniversary of the birth of Robert Burns, Scotland’s greatest poet and an iconic figure in popular literature. In support of the Scottish Government’s ‘Homecoming Scotland’ celebrations, the NC Graphic Design students at Edinburgh’s Telford College were set a brief to realise a single Burns poem as a double-page spread. Two years on, and this time around design tutor and Curriculum Lead David Wilson gave the Burns project to his Graphic Design HND1 class. poet of Scotland, and is celebrated worldwide. commentaries, with as much to offer as ever. 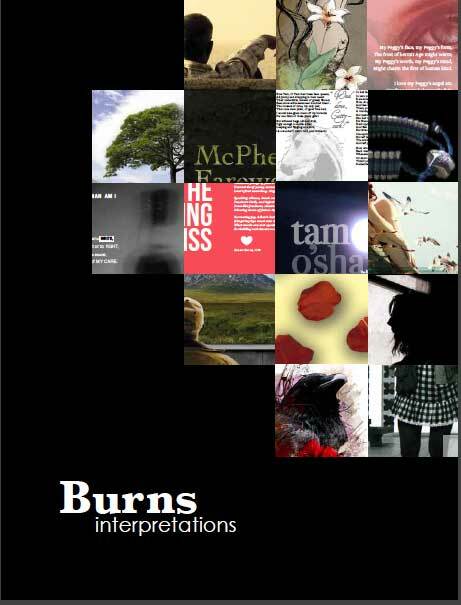 The task was to produce a piece of artwork that brings Burns’ work to a young, contemporary audience, using typography and imagery to create a double-page spread, interpreting one of his poems or songs. The imagery could be photographic or illustrative, but avoiding clichéd Scottish images such as thistles, tartan and the traditional portraits of Burns himself." This time around the students got involved in the pre-press and production stages, setting the running order and organising the whole layout of the booklet, which runs to 40 pages. Check out the results in pdf format.